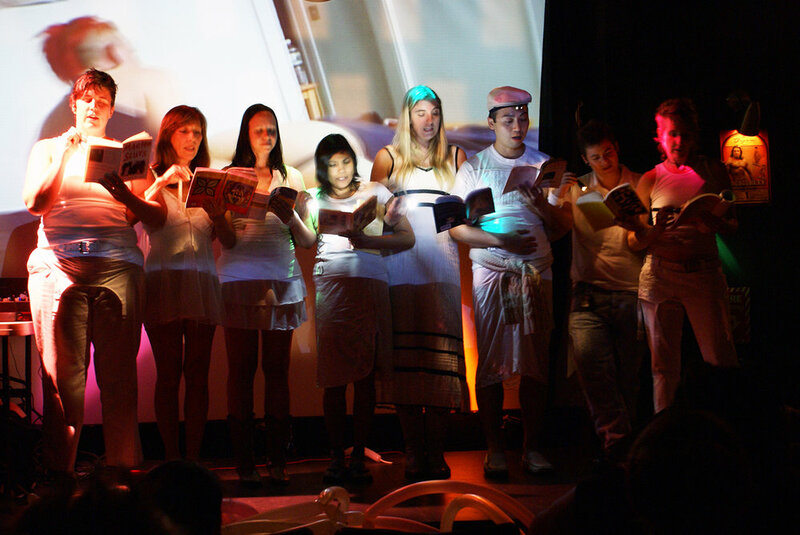 The book Performing Revolutionary: Art, Action, Activism invites artists, activists, and everyone else to learn about public actions and ceremonies for building the revolutionary skills we need now. It is part utopian instruction manual, part artistic memoir, and part love letter to the sacred work of making radical change. Written by Nicole Garneau and edited by Anne Cushwa, the book features essays by Nicole Coffineau, Anne Cushwa, and Daniel Tucker, as well as photographs by Tara Malik, Ruth Robbins, and many others. On sale now! Published by Intellect Books. Listen to Nicole interviewed by Nance Klehm on her show "Spontaneous Vegetation" on Lumpen Radio, WLPN 105.5 FM Chicago. Nance Klehm's Spontaneous Vegetation radio show is long format conversations with folks who find the cracks, break up the compaction, remediate the contamination and leave the soil (metaphorically or literally) better for us all. Video of Nicole Garneau as host/emcee of the Clear Creek Solstice Spectacle, June 2018, sharing Performing Revolutionary in an outdoor performance. Experience Clear Creek Creative's Solstice Spectacle as filmed and edited by Tommy Johns & Will Hartsock of 750four Productions. The Spectacle was produced by Carrie Brunk & Bob Martin in the summer of 2018. Animate Your Activism: Bring your issues and practice revolutionary strategies together. Get a bold infusion of creativity into your social justice work! Build Community: Enliven a particular time, place, or space by creating performance actions that teach Revolutionary history. Make performances and live art in public, with people. Practice strategies for engaging political content and reclaiming public space for art. 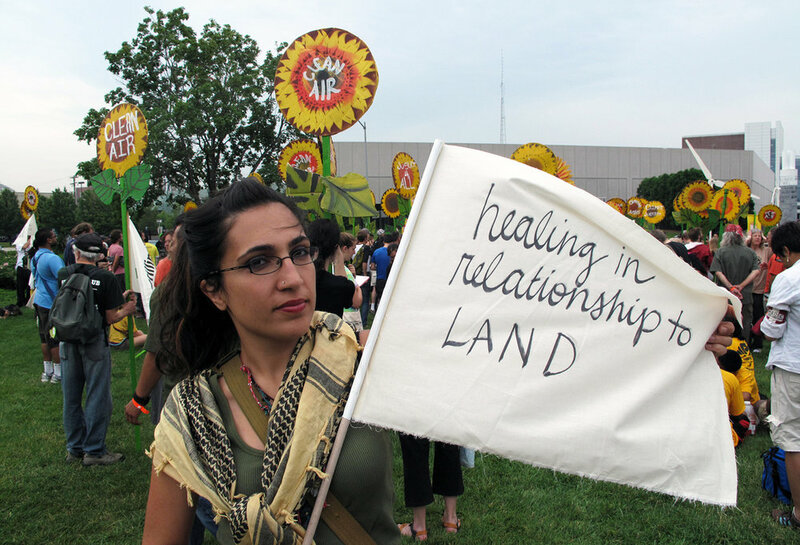 Make Sacred Space for Justice: Non-religious ceremonies and rituals that knit communities together and create heart-centered activist spaces. Great for opening or closing events! AJ Sacco in UPRISING #5. Photo: Aurora Tabar. UPRISING performances are collaboratively-created "public demonstrations of revolutionary practices." They bring people together in participatory actions that reclaim public spaces, engage compassionately, speak bravely and honestly, and activate bodies in the world. Art-Action-Activism Workshops and Teaching Residencies are customized for a few hours or a full semester. All workshops are based on Revolutionary Strategies outlined in the book Performing Revolutionary: Art, Action, Activism by Nicole Garneau. 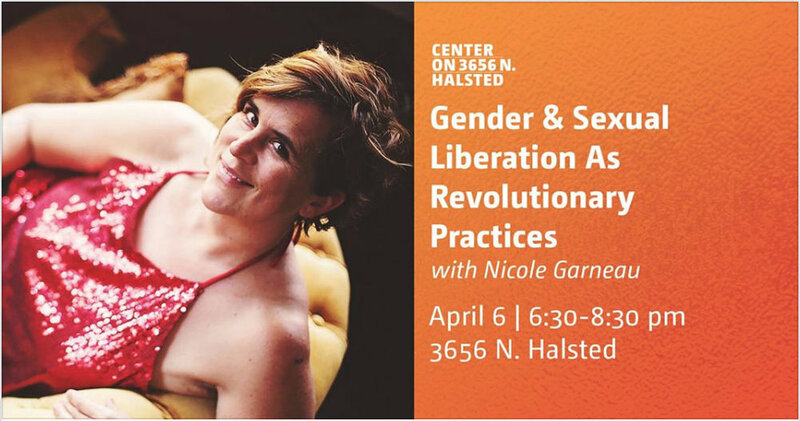 Nicole Garneau is available for events focused on the recently-published Performing Revolutionary: Art, Action, Activism. All events include opportunities for public engagement and lively discussion tailored to the space and the audience. Dance party optional! April 3, 2018, Nicole presented an interactive performance and book talk at Chicago's MCA.